Back at Armadillo Willies to record a Lunch with Philip and Greg with the esteemed Steve Martin of Ripple Training. Because we had a long trip home and would be eating dinner late, we both opted for the Brisket meal. We enjoyed the BBQ at Armadillo Willies. I have no idea how authentically Texan it was. 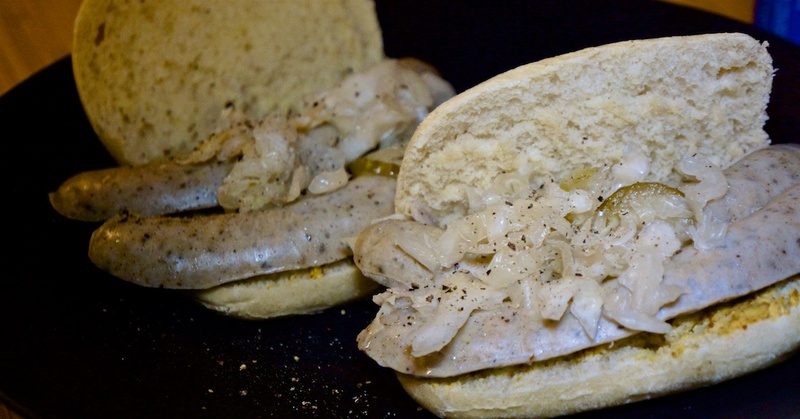 Back home and looking for something simple, we reheated some Trader Joes OctoberFest bratwurst and put them in a finished par-baked roll with sauerkraut and mustard. Two were more than Foodie Greg could eat, but Foodie Philip managed! Dinner tonight cost $2.70 per serve. Lunch today cost $11.59 per person. For dinner a large group of conference goers walked down to BJs. The Foodies shared a Deep Dish Zitti and Jumbalaya, having half each. The bill was split evenly among those there and our share included two Porters (beer) each. Dinner tonight cost $31.13 per person. Lunch was provided as part of the conference package. There were several options: Foodie Philip had a Buffalo Chicken Wrap, while Foodie Greg had a grilled vegetable sandwich. Lunch today had no direct cost. Dinner was served as part of the Conference Expo session and was included in the conference price. Food consisted of make-it-yourself chicken burritos and had no direct cost. Much later in the day we had a toasted ham and cheese sandwich at $5.99 each. Ensconced in our hotel in Cupertino for the conference, we joined a party of conference goers at Armadillo Willies for BBQ. Dinner tonight cost $16.29 per serve. Because it was LACPUG night, we had pizza after the meeting. Each of us contribute $5 per person. A return to the gyro meat wrap, but without cucumber because we didn’t have any! We returned to the delicious Reuben casserole because we still had three serves left. Trader Joe’s have a Sauerkraut with Persian Cucumbers which combines two ingredients for $3.99 a jar, or 67c per serve. Packaged, shredded Swiss & Gryere $4.99 or 83c per serve. Although we used the full packet, it was probably closer to three cups than four. A pint of half and half is $1.49 and half was used or 13c per serve. Organic eggs are 50c each or 25c per serve. We skipped the caraway seeds for taste reasons but the mustard adds another 15c per serve. Dinner tonight was, as always, delicious and cost $3.03 per serve. 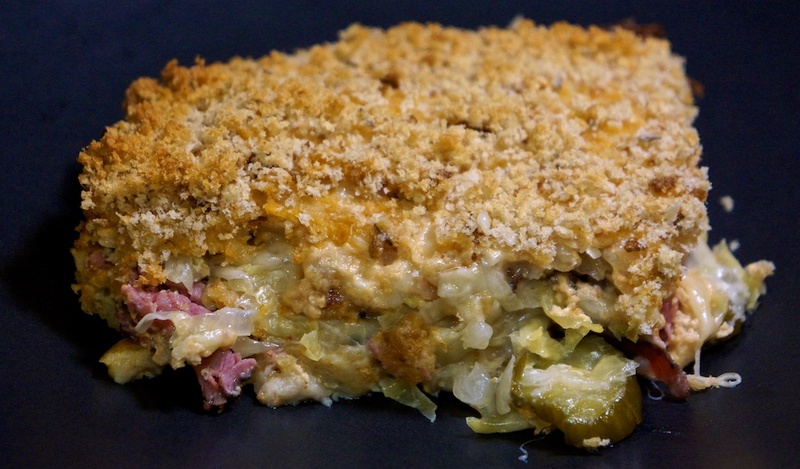 If you like a Reuben sandwich, you will love this casserole. An unusual Burbank Monday schedule but Foodie Philip was still at In and Out Burger for his Double Double Animal Style. Foodie Greg finished the Quinoa Chowder. Don’t tell Foodie Greg but this is a savory bread pudding (he’s not a fan of ‘bread pudding’). Let’s pretend it’s a strata! We were going shopping anyway, so we hopped down to our favorite Mexican place Carnitas Michoacan for a pair of asada burritos. Lunch cost $5.50 per serve with tax. Add 30c per serve for spring onions, spices. This is a rather good soup and one we’ll be repeating for $4.87. You can get cheaper domestic feta, but French feta is definitely superior. Once again, we decided on a tuna melt on an onion bagel. Add 30c for the spring onion and celery per serve. Lunch was $2.25 per serve and delicious. The final two serves of Pioneer Woman’s Sausage, Potato and Kale soup from October 17. Six par baked rustic rolls were $3.29 or 55c per serve. Tonight’s dinner cost $3.78 per serve. 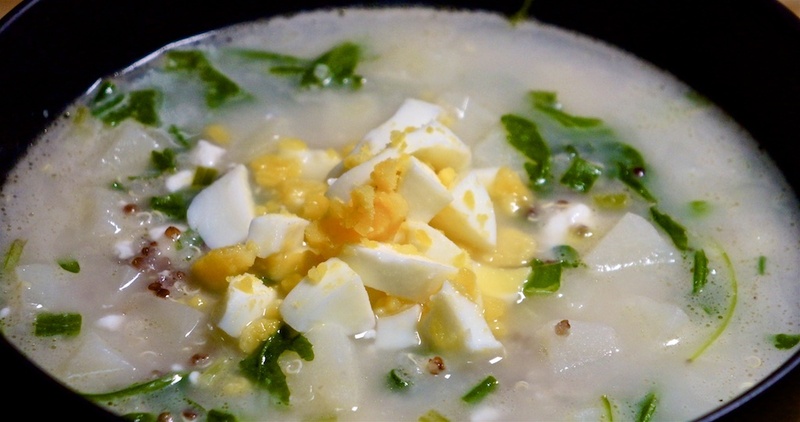 It’s an excellent soup and well worth the effort. The Yero pack being finished we got some precooked and sliced chicken breast. Lunch today cost $2.89 per serve. Foodie Greg had an idea for a modified Cob Salad: swap out bacon and chicken for Trader Joe’s Cooked Pork Belly, that we reheated by smoking! Trader Joe’s fully cooked pork belly is $6.49 for the pack or $3.25 per serve. The organic baby plum tomatoes were $2.79 for the pack but we used half, or 70c per serve. 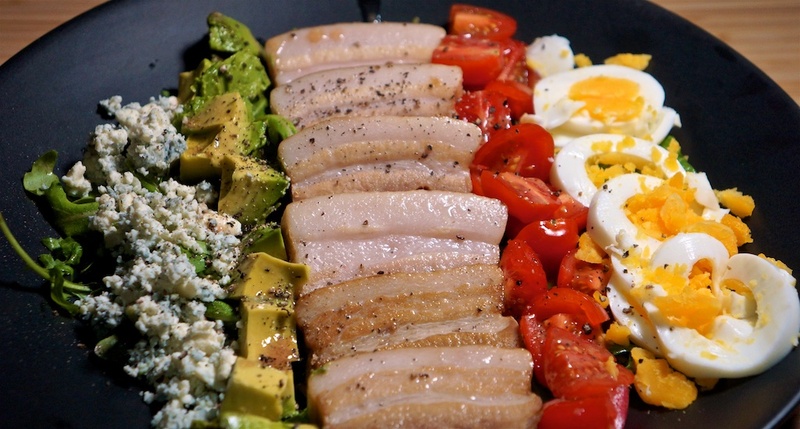 Tonight’s Cobb Salad cost $5.78 per serve. The smoked pork belly was delicious, but probably a little out of balance with the total meal. We think it would be better to serve less of the pork, and have some chicken as well to balance the meal. But the smoked pork belly was delicious!